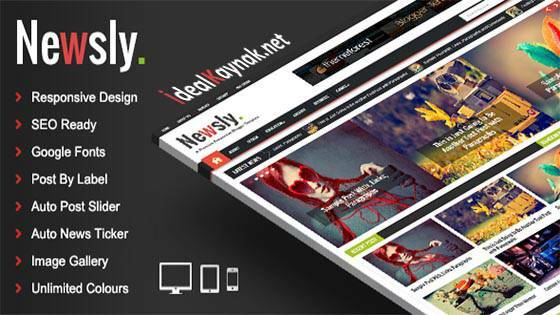 Newsly – Responsive Multipurpose Blogger Template is a modern, beautiful look and clean flat style fresh responsive blogspot design having great professional qualities as same as WordPress Themes contain in them. This theme is perfect for news, magazine, blogging guides or personal websites. It is build using light weight coding that support many electronic digital devices such as Android mobiles and Tablets, and other PCs etc. It automatically adopts any screen resolution of any digital device smoothly and perfectly. In other words you can use it for almost any kind of topic or niche whatever you want. It has cool premium web design that attract users to it by its eye catching and professional qualities.